A pre-war design, based upon the British Carden-Loyd Carrier, these tiny vehicles were built and used in vast numbers by the Italian Army in WWII. It was built under license in Italy and given the designation CV-33. it was renamed the Carro Valoce L3/33 Lanciafiamme in 1938. They had been employed by the Italians in Ethiopia and Spain and sold to other nations including Hungary, China and Brazil. Against unarmoured troops they had some potential but confronted by tanks, or even armoured cars, they were death traps. 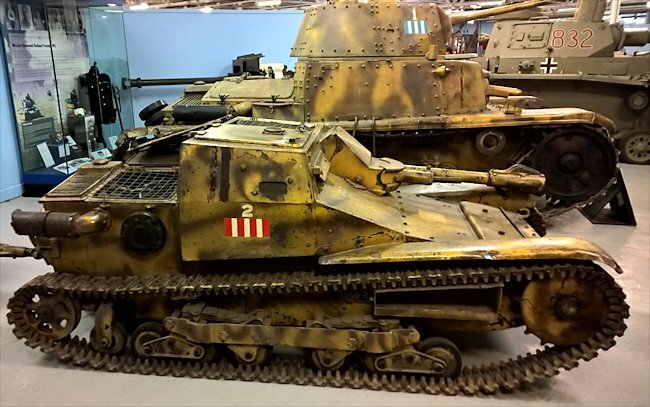 The Italian Army Carro Valoce L3-33 tankette at Bovington tank museum in England was captured in North Africa. It is a flamethrower which carried 500 litres of flame fuel in a special two-wheel trailer. Fuel was delivered by a pump, driven off the gearbox, which gave it a flaming range of about 40 yards. In fact the pump was so weak that crews were instructed not to use flame, when driving at full speed, for fear of setting themselves alight. Although a number of these flamethrower carriers were captured in the Tobruk area there is no evidence from British sources of them ever being used. The tiny vehicles were very cramped inside and must have been ghastly, when closed down, in the desert. Add to that the risk of having fuel pumped through the centre of the vehicle and any reluctance to use them is understandable. It had a crew of 2. It only had a thin welded armour of 6mm to 12 mm in thickness that was barely enough to protect the crew from machinegun fire. 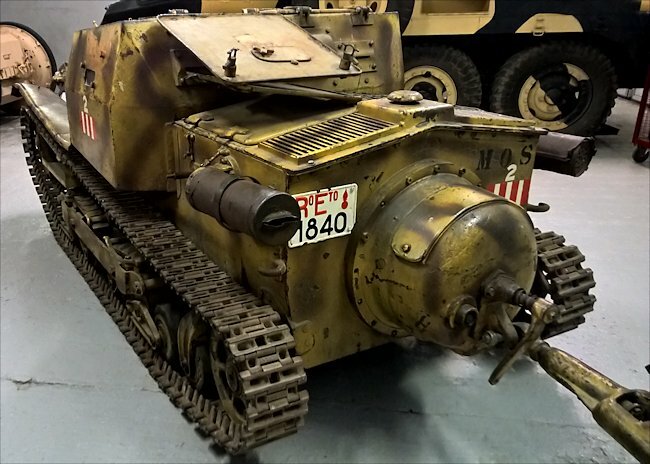 In addition to the flame thrower it was armed with a 6.5 mm machine gun It had a top road speed of 42 km/h (26 mph) and weighed 3.2 tons. It was produced by Fiat Ansaldo. On a plus side they L3/33 was fast and had a low profile which made it difficult to hit. They also were quite economical being quite cheap to produce and they had a low fuel consumption engine compared with other combat vehicles. 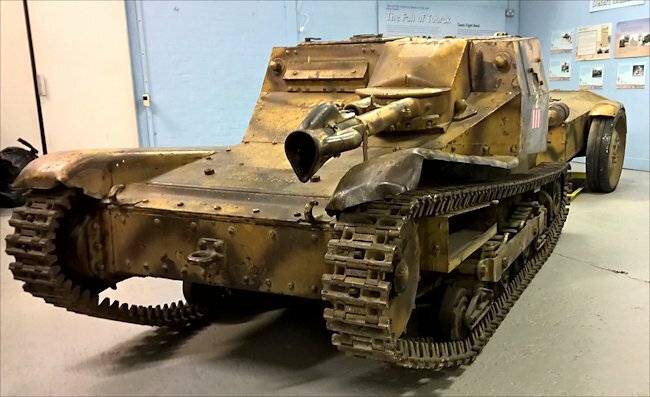 Where can I find preserved L3/33 tankettes?